I am importing an s-parameter model of a specific block into cadence virtuoso. I see some kind of ringing in the transient simulations. Do you know how to get rid off these artifacts? How are you importing the s-parameters? I assume you mean that you're using the nport component in analogLib and simulating in spectre? If so, which spectre and IC version are you using, what is the source of the s-parameters (what do they represent) and knowing what the options specified on the nport would help (perhaps you can post the line in the spectre netlist containing the nport). Having some idea of the range of frequency sample points in the s-parameter file, how they are spaced, and what the typical frequencies in your circuit are likely to be (including harmonics). Sorry about the large number of questions, but you provided very little information to allow the issue to be diagnosed. Sorry for the late reply. Yes I am using nport component in analog lib and simulating in spectre. I am using ICADV12.3-64b. The s-parameter is for a lossy channel. 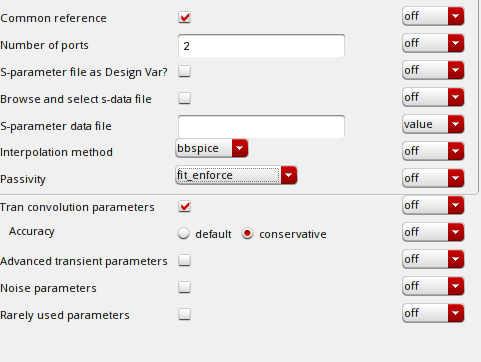 I used bbspice option with passivity set to fit_enforce. I didn't set anything in the advanced transient parameters. I set accuracy to be conservative. I also observe differences when I use linear. Which one is more suitable for transient sim and what are the differences between these two? My frequency range is from 0 to 50 GHz with 10MHz spacing. I am interested in the frequency profile upto 26 GHz mostly. I have attached the image of the nport set-up (note that I am going to use an s2p file for 2 ports). Please look at 7 Habits of Highly Successful S-Parameters which is a good starting point. I'm not sure what exactly your "lossy channel" is - if it's essentially a passive network (such as extracted by an electromagnetic simulator), then bbspice would be the best choice. I would start with the default parameters though rather than tightening the accuracy and trying to force fitting or anything like that. If it's not passive, then use linear (with sufficient number of points, linear would be reasonable). You might also want to add "-cc" to the spectre command line (in ADE go to Setup->Environment and add -cc in the userCmdLineOptions field). In general you don't want this (for performance0 but clearing the cache would mean that you get any warning messages produced by the simulator when it produces the time domain model. It should tell you information about how it managed to do the fit, any problems, plus (with bbspice) the fitted s-parameters. You can plot both the original s-parameters and the fitted parameters (they can be opened as a result database in ViVA) to check if the original data is smooth, and whether the fitted parameters look significantly different. Thanks for the reply. I looked at the document. The document says it's better to use linear/spline for 3mm cable, which is kind of similar to what I have (I have an sparameter for package and pcb trace). In that case, should I trust linear interpolation. Meanwhile, I will do some checks based on what's mentioned on the document.